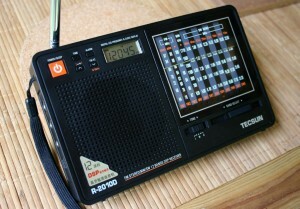 The Tecsun R-2010D portable shortwave radio. The Tecsun R-2010D is a mechanically-tuned DSP based portable shortwave/AM/FM radio. Tecsun first announced this receiver three years ago with the model number R-2010 (click here to see the entry in the SWRI). While there are a few other mechanically-tuned DSP portables on the market–the Degen DE321,DE32, Kchibo KK-9803, to name a few–the Tecsun R-2010D stands apart in that it has a digital frequency display. Tecsun was able to achieve this by building the R-2010D around the SiLabs Si484X chip set. The R-2010D represents the best of the mechanically-tuned DSP radios in many respects, save its abysmal selectivity (at time of posting). Click here to read our full review of the Tecsun R-2010D. I can confirm that our comments have been sent to Tecsun for review; hopefully, they will make adjustments to improve selectivity. The Tecsun R-2010 is sold by several Chinese sellers on eBay. Click here to search for one. This entry was posted in Portables, Tecsun and tagged DSP, Portables, R-2010D, Tecsun, Tecsun R-2010D. Bookmark the permalink.